What a beautifully moving book. All This Time by Melissa Tagg exemplifies Christian contemporary romance at its finest. With themes of redemption, grace, love, and faithfulness, Tagg spins a story that is equally reminiscent of her trademark writing style of which so many of us discovered her novels and her newfound freedom in writing books for the independent market. Humor abounds in heroine Raegan Walker, whose love for the artistic is embedded in everything she does and is. Deep and wounded hero Bear McKinley is the hero all female readers love to love. Where Tagg stands out in All This Time is delving deep into the painful and heart-wrenching stories these two characters have lived–and all too often, what readers experience in our day-to-day lives. With freedom to explore these deeper and heart-wrenching subjects that CBA publishing houses typically restrict, Tagg is able to fully gift her readers with God’s truth, grace, and love. This book will speak to readers long after they close its final page. Award-winning author Melissa Tagg is a former reporter, current nonprofit grant-writer and total Iowa girl. The second book in her popular Walker Family series, Like Never Before, was named to one of Publisher’s Weekly’s Spring 2016 Top Ten lists. Her most recent releases include Keep Holding On (Sept 2016) and One Enchanted Eve (Nov 2016). Melissa has taught at multiple national writing conferences, as well as workshops and women’s retreats. When she’s not writing, she can be found hanging out with the coolest family ever–not that she’s biased–watching old movies, and daydreaming about her next book. Melissa loves connecting with readers at her website and on Facebook and Instagram. Can she forget the fumbles of her past and open her heart to love? He breathes football. She shudders at the very mention of the sport. After a tragedy involving a football player destroyed her family, athletic trainer and graduate student Cassie moves across the country looking for a fresh start, but a change in financial aid lands her in the middle of her worst nightmare. Meanwhile, rookie coach Reed worries his dream career will slip away as injuries plague his players and his star receiver teeters on the brink of ineligibility. As the two work together to salvage the season, sparks fly, and Reed must eventually choose between the game and the woman he loves. My family enjoys sports; from Sunday afternoons watching football to games of wiffle ball in the background, competitive athletics have always been an important part of the Deshaieses lifestyle. Even though I am not one of athletically inclined members of my family, I have spent many years cheering on my brothers while they pitched for their teams or enthusiastically waiting for the Steelers to score touchdowns. I might not play sports…but I know my games. 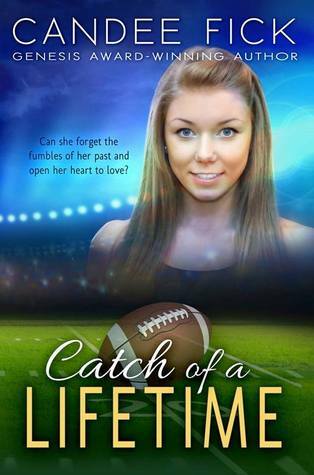 Candee Fick, a Genesis Award winning author, provides a way for those of us who love sports to experience the thrill of the game and all that goes with it in Catch of a Lifetime. This football based novel, a contemporary fiction book released by Bling! Romance, pulled me into the world of college football unlike any other novel I have read. Catch of a Lifetime first caught my attention when I searched through Lighthouse Publishing of the Carolinas’s website a few months back. I like watching football, and historical fiction was overtaking my to-be-read list, so I thought this novel could give me a good dose of contemporary fiction. Fick’s novel was so much more than good contemporary fiction–Catch of a Lifetime is a wonderful story filled with themes of forgiveness, integrity, and acceptance, and sprinkled with faith, family, and authentic romance. This novel has everything I look for in contemporary fiction, and after reading Catch of a Lifetime I am truly excited to see what other contemporary stories Fick will follow her debut novel with. Writers are told to “write what you know” because authenticity comes from true life experiences. Fick comes from a football family, so Catch of a Lifetime is therefore infused with not only facts about the game, but the emotions, thoughts, cares, and concerns of those who play and participate in this American sport. Through this authenticity of someone who is a wife to a coach and a mother to a player Fick’s characters are able to demonstrate the unique challenges and joys that come with football. While my family is more baseball-oriented than football-oriented, Fick’s writing is so genuine that I could immediately empathize with Reed and Cassie. In being drawn into Reed and Cassie’s world, Fick brought me back to my undergraduate college days–just one of the many seasons of my life in which I spent time at baseball fields, but also many wonderful hours on campus in classrooms and with friends. I loved my time in college and often wish I could go back to those days where homework, friends, and a part time job filled my days. I am not so niave that I believe going back in time would be a good thing, but I did so enjoy Catch of a Lifetime for returning me to a college setting where I could imagine wandering the campus and filling my mind with all things related to college studies. The dialog, descriptions, and character interactions were realistic and believable–I could easily visualize the relationships, activities, and goals of the characters happening on any college campus today. Fick is a talented author who wields words that read as authentically as the life we live in today’s modern world. Her gift at creating contemporary stories that mirror the challenges and joys we experience not only bring new worlds to life (for those of you who, for example, do not know football), but also share perspectives and lessons for those who have shared Fick’s experiences. Catch of a Lifetime brims with characters who share the Christian faith but remain honest in the struggles that we all face. Fick infuses her characters’ reactions to the challenges of the modern world with subtle Christian lessons that adults, both younger and older, can apply to their own lives. This quiet inclusion of Christian princples shares the viewpoint of a faith that teaches respect, love, and honesty; Fick’s characters are not perfect, but their determination to live with this Christian faith is a way for readers to take in these principles without alienating themselves from their peers. Catch of a Lifetime has quickly become not only one of my favorite books of 2015, but of all time. I recommend this book for teenagers (ages 16+) and adults, both male and female, who enjoy contemporary sports fiction from the general and CBA markets. For a novel similar to Fick’s debut fiction story, look into Sally Bradley’s Kept. Author of inspirational romance, non-fiction, and devotionals. Candee is married to a high school football coach and is the mother of three, including a child with special needs (thus providing inspiration for her first two non-fiction titles). 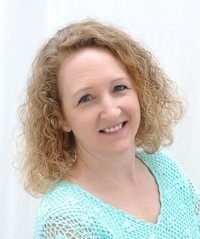 She is a member of American Christian Fiction Writers and a Double Finalist/Winner in the 2014 ACFW Genesis contest in the short novel category. Her debut novel, Catch of a Lifetime, released in November 2015 from Bling! Romance. Connect with Candee on Facebook, Goodreads, Amazon, and her website.